I am living vicariously through all of the great Christmas dessert recipes that are floating around on all of my favorite blogs. I have not baked a single thing this season. I am hoping to just enjoy all of the fun Christmas treats at my Mom's house and until then I will continue swooning over treats like these white chocolate peppermint bars. I would be happy with just the first and third layer of these three layered dessert bars. 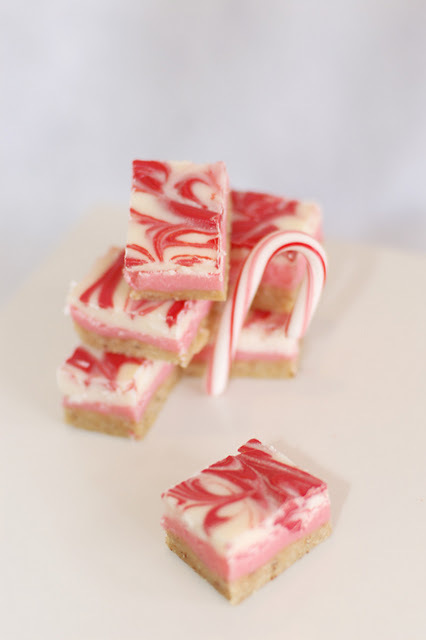 You can get the white chocolate peppermint bars recipe over at Tradewind Tiaras. If I'm going to make cookies, I like them to be bar cookies. These look so pretty and of course yummy too! Thanks for your kind words about my recipe! I think no-bake bars are the only kind that are getting made this year, unfortunately--my oven died on Friday!